Hi Eve: I wanted to drop you a note because Enrique Valero is returning to Los Angeles for a special food and wine event that he thought you might enjoy: an exclusive tasting at the City Club, showcasing five top wineries and world-acclaimed gourmet food products from Spain’s Castilla y León región. Castilla y León, the largest autonomous community in Spain and home to over 60% of Spain’s heritage architectural and cultural sites, also produces 69 traditional food products, including roast suckling pig, Iberico ham and many coveted cheeses. 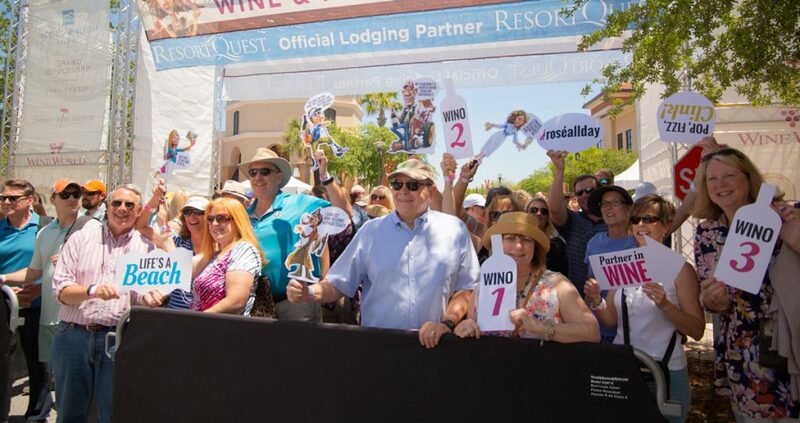 Winery principals and food producers will be on hand to discuss their products, and would love to meet you. Featured wineries include Abadia Retuerta, Cesar Principe, Dominio del Pido, Emilio Moro, and Pago de Carraovejas. Well. Have to say for a small tasting event, I was very impressed with the quality of the food and wine from Castilla y León and am looking forward to our trip even more. Walking up to a table with a ham hock, a butcher and the sharpest knife to cut the slimmest samples of ham I thought, oh, it’s a prosciutto. Nope. It is Ibérico ham. Right off it looked redder and had slimmer veins of fat. I also learned that the ham had been aged for four years. On the taste: I loved the subtle slightly gamey flavor, and it was less salty and generally a stronger structure than Prosciutto. I liked it so much I went to the Fermin website to learn more – that information is at the end of this article. Along with the ham there were four hard cheeses, from sharp to smoked, each was meant to sample with specific teas. I stuck to the wine for my pairing. And I thoroughly enjoyed the cheeses and the ham together. Of the wineries, Abadia Retuerta, Cesar Principe, Dominio del Pido, Emilio Moro, and Pago de Carraovejas, I enjoyed them all. All of the reds were either 100% Tempranillo or a blend, the whites were also blends. Abaida Retuerta is already a favorite of mine, as mentioned above, but this time I also enjoyed many of the wines from the other wineries in the area. These are the ones I hope to find again in Spain: Cesar Principe 2015 Tempranillo, Dominio del Pido 2018 Rosado and 2015 Ribera Del Duero Tempranillo, Emilio Moro 2016 Tempranillo and 2015 Malleolus Tempranillo, and Pago de Carraovejas 2016 Ribera Del Duero Tempranillo, Ossian 2015 White Wine and, of course, everything I can try at Abadia Retuerta Domaine. FERMIN acorn-fed, free-range ham comes from 100% IBERICO pigs. During the Acorn season (from September to February) known as Montanera, these animals double their weight on a diet based of acorns and grass. They go from 200 to 400 pounds! Free RANGE: Our Grain-fed free range Iberico is 100% Ibérico, fed on grains, grasses and all that nature provides. 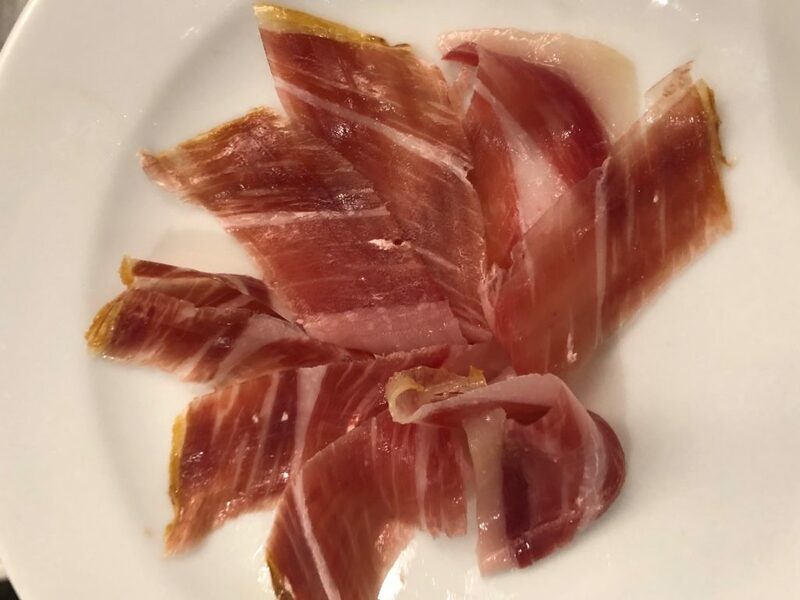 Also known as the “Kobe beef of pork” because of its intense marbling, flavors and uniqueness, the FERMIN Iberico ham is the first authentic Iberico to enter the US market. Cured for a minimum of 36 months, this Iberico ham…melts in your mouth. Grain-fed 50% Iberico: We cross a 100% Iberico pig with a 100% Duroc pig, and the result is phenomenal: An affordably produced, lower fat content product that maintains its characteristic visual fat marbling. 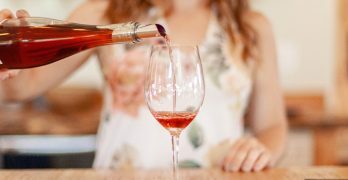 NEW YORK (PRWEB) – Millennials may have killed canned tuna and mayonnaise, but when it comes to wine and cheese, they are willing to put their money where their mouth is – and that bodes well for imports. “Millennial consumers have sophisticated palates, and their taste in both cheese and wine extends beyond U.S. borders,” said Charles Duque, Managing Director Americas for the French Dairy Board. “They grew up going to grocery stores stocked with imported goods, and these luxuries became part of everyday life. Additionally, with the popularity of Instagram, Millennials are deliberately choosing foods to eat and share that make a great ‘gram’,” he added. In cheese terms, varieties that are gooey, like a runny brie or one with a pop of color like Mimolette are popular with Millennial consumers. The Cheeses of Europe Marketing Campaign, orchestrated by CNIEL (The French Dairy Inter-Branch Organization) and funded in part by the European Union, was designed to create awareness for the variety of European cheeses available in the U.S. market and to suggest ways that American consumers can incorporate those cheeses into their diets, recipes and lifestyles. The campaign’s goal is to increase the appeal of European cheeses and strengthen their competitive position in the growing specialty cheese category. It was a thrill to taste the newly released 2012 wines (and one 2014!) 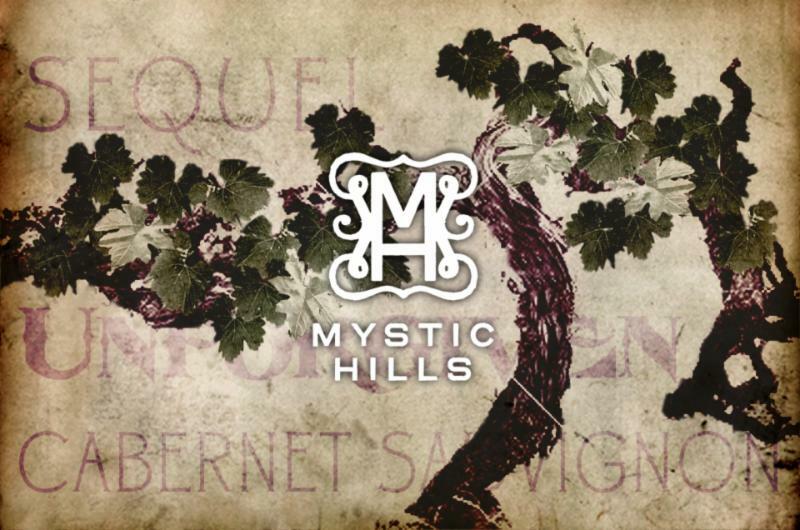 from Mystic Hills Vineyard because…every wine from their first release has received awards from various competitions! (Read more here) And this, just their second release, is poised for the same level of achievements. 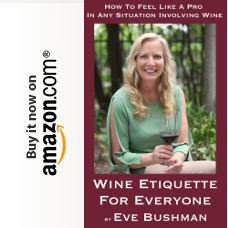 I invited a few wine lovers over to share these first tastes, and to also chime in on the aromas and flavors they found. And, if you’re not interested in tasting notes know this: the tasting was a resounding success with all six guests agreeing that the wines were superb. 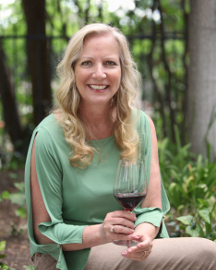 With vibrant aromas of fresh strawberry, ripe raspberry, wet stones and a hint of Meyer lemon it was followed up in the mouth with the same luscious red fruit flavors with the addition of apricot, red ruby grapefruit and a welcoming mild acidic finish. We paired this Rosé with a BBQ Shrimp recipe that actually has no BBQ sauce or required barbequing; it was just all garlic, unsalted butter, Worchestershire sauce, lemon, pepper and Cajun seasoning. The Rosé was the perfect refresher between bites. 90 Eve pts. Sweet plum, cherry, black fruit, toasted marshmallow, wet bark and red rose wafted up in the nose of this Cab. The taste was all cherry, raspberry, earth and a bit of oak with mouth drying tannins. This one was voted “easy to drink” by the group. Bordeaux blend of Cabernet Sauvignon, Cabernet Franc and Merlot. Blueberry, black currant, blackberry, incense and earth – all on the nose. Then with the taste we got beautiful red to blue fruit, spice, firm tannins and a nice long finish. As we let this open up in our glasses we noted more fruit developing. 90 Eve pts. Bordeaux blend of Cabernet Sauvignon, Cabernet Franc, Petit Verdot, Merlot and Malbec. Aromas of dried blue fruit, cloves, mushroom and black pepper filled our noses. Once tasted we found robust jammy qualities with red fruit, spice and cracked pepper all in great balance. My husband had guests wait to finish this stellar blend with a chocolate caramel Crème Brûlée he had made. As he torched the sugar and fresh mint into a crust, we waited expectantly. It was magical. 92 Eve pts. With the pairing, 93 Eve pts. All three reds were paired with our cheese and charcuterie appetizer. Some also enjoyed the reds with the BBQ shrimp, and due to the pepper and spice in the dish, I agreed that it worked well. Our final course, DRY-AGED TBONE, and all of the wines. Lovely round mouthfeel filled with lush tropical bruit, pebbles and a mildly sweet finish. Some found the pairing to have a bit too much sharp citrus in the dish, but the fish was so fine and clean I felt that it worked, the wine served its purpose to rinse away the citrus and allow me to linger over the tender fish. 2012: A bit drier than the 2014, probably due to age and vineyard conditions that year, also showed darker black fruit, green peppercorn and tannins. The dish of smooth and creamy Burrata complemented both wines very well. The 2004 was Port-like, dried berries, dark cherry, tannic and a superb balance. The wine expanded some of the spice of the tartare; and this proved to be my favorite dish in the luncheon. Lots of spice on this wine, then came rich dark fruit and cinnamon. This was quite a decadent dish with incredible richness from both the pork belly and blood sausage. I found that the char on the pork belly was quite enhanced by the wine, allowing for a sweetness to escape. I started to wish I had been there not for a wine luncheon where I could only taste, I wanted to linger over these pairings and finish all of the wines. Surprised to find red, blue and black fruits all on the palate – and very velvety – as well as spice, pepper. The T-bone was incredible. This again was a pairing I wish I could have completely consumed. From Ogron I learned that Tesse and the wine store is his “baby.” Eighty percent of the wine inventory is not sold elsewhere, and he hopes to get the “winemaker collector series (from Abadía Retuerta LeDomaine) if Enrique agrees.” I asked about the corkage fee if one were to buy from the store to have with their meal and learned that it is only $15. 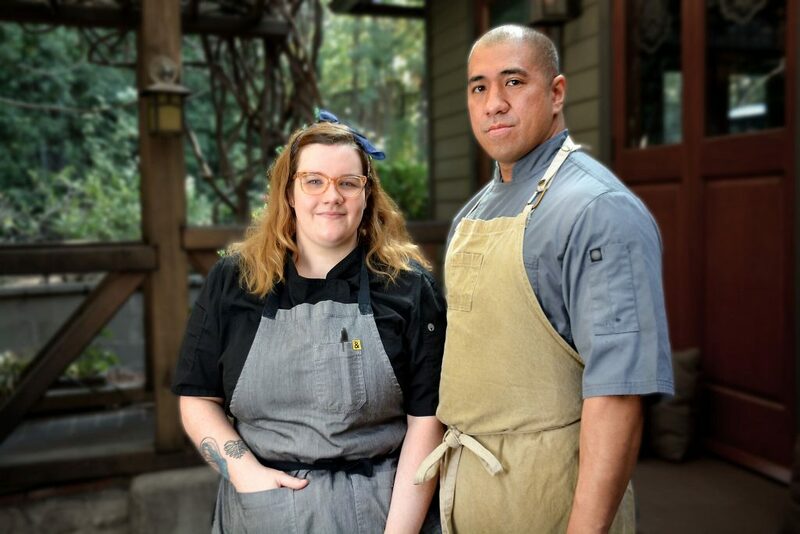 Tesse is a French restaurant featuring the dynamic, continental-inspired cuisine of Chef Raphael Francois and Pastry Chef Sally Camacho Mueller, served in a chic dining room on Sunset Boulevard in the heart of West Hollywood. An extensive wine program from Jordan Ogron is supplemented by Boutellier, an exclusive wine store adjacent to the restaurant. A French-leaning craft cocktail program designed by Nick Meyer and Julian Cox is offered at the bar. The restaurant’s name is a contraction of the French delicatesse, meaning ‘delicacy’ or ‘thoughtfulness’ — it’s also used across France as a colloquial term for charcuterie. And while the iconic pâtés, terrines, rillettes and saucisses of his homeland are central to the menu, Chef Raphael also features a broad and finessed take on French classics, with meats and fish prepared on the wood-fired hearth that anchors the kitchen and lighter fare inspired by near-daily trips to LA’s outstanding Farmers Markets. Tesse’s menu is designed with wine in mind. 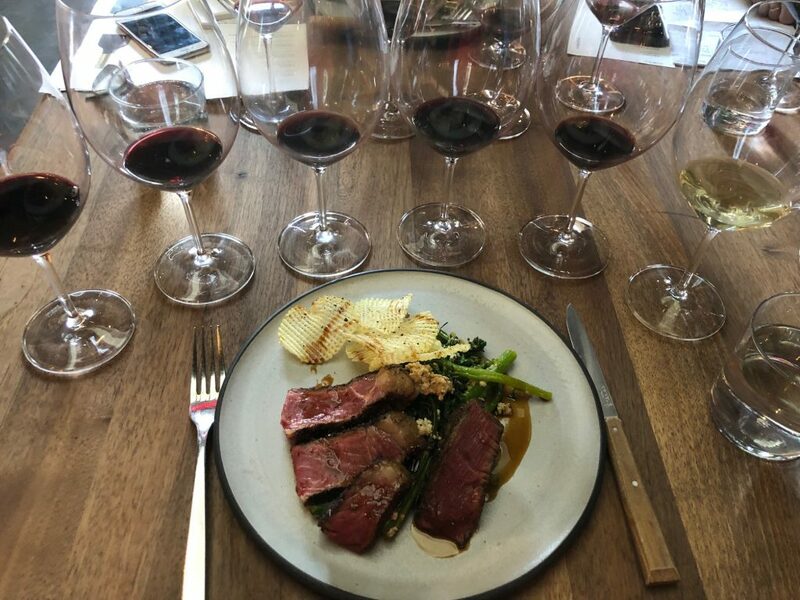 The food pairs beautifully with a vast, interactive wine program designed by Jordan Ogron, which features nearly thirty wines by the glass and a list of more than three thousand selections. For those who prefer something a bit stronger, the craft cocktail program was designed by Nick Meyer and Julian Cox, the duo behind many of the most notable bar programs in Los Angeles. The winery’s gold-standard wine is the Selección Especial, which reflects the essence of the estate – 75% Tempranillo, 20% Cabernet Sauvignon and 5% Merlot. Proof of its superb quality, the 2001 Selección Especial was awarded “Best Red Wine in the World – Red Wine Trophy” in 2005 by London’s prestigious International Wine Challenge competition. In addition, Selección Especial is the first Spanish wine to be included for three consecutive years on the list of the 100 Best Wines in the World, which has been published annually since 1988 by highly regarded Wine Spectator magazine. Other wines produced at Abadía Retuerta include: Pago Negralada, made with the best Tempranilla vineyard on the estate; Pago Valdebellón, from Cabernet Sauvignon; Pago Garduňa, a very intense, clean, fruity and mineral Syrah; and PV (Petit Verdot), an elegant wine with a limited production of 1,000 bottles per vintage. The 2012 vintage of Pago Negralada and Petit Verdot have been ranked among “the greats” with 97 and 98 points respectively, according to the Gourmets Guide. For the 2014 vintage, Robert Parker Wine Advocate awarded Pago Negralada 92 points and Petit Verdot 93 points, along with 92 points for Pago Garduña and 93 points for Pago Valdebellón, which also won the Top Medal Master granted by The Drink Business Global Cabernet Sauvignon. Blanco Le Domaine 2016 scored 93 points in the Peñín Guide and 96 points in Guía Gourmets. 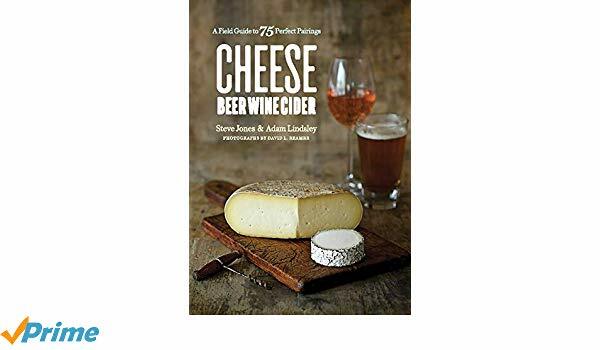 NEW YORK (PRWEB) – With new ways for consumers to brew their own beer, grow their own produce, and craft their own clothes, there needs to be a more convenient way to make their own natural, affordable cheese. Fromaggio is the answer consumers have been looking for as an all-in-one, automatic home cheesemaker that can produce a variety of delicious cheeses, easily and efficiently. The team behind fromaggio showcased the innovative cheesemaker at CES on January 8th-11th in Las Vegas prior to the company’s launch on Kickstarter in March of 2019. Fromaggio puts a factory full of complex and messy cheese equipment into a sleek, easy-to-clean appliance on any kitchen countertop. Users simply pour in milk, cultures and rennet, choose from a default cheese setting or customized their own, and fromaggio automatically handles the rest. The appliance heats the milk, mixes, cuts the curd, drains the whey, and even presses, resulting in the perfect hard or soft cheese. Processed grocery store cheese is full of additives, and imported cheese in specialty shops is overpriced and not always available. Whether users have a passion for making artisanal foods or they’re just a cheese lover, fromaggio will finally bring consumers the high quality, gourmet cheese that they are increasingly demanding. This smart cheesemaker has an LCD touchscreen display for easy programming and synchronization with a mobile app via Bluetooth. The app enables users to control the machine, read instructions, order ingredients, share recipes and more. Fromaggio will be available to pre-order on Kickstarter in March. The fromaggio brand proudly introduces a modern, sleek, easy-to-clean appliance that functions beautifully on a kitchen countertop. Fromaggio is on a mission to change the way the world creates and consumes cheese — a treasured, historic… and one of the most processed foods. The brand’s primary goal is to educate and inspire consumers to make healthy, artisanal quality cheese easily and efficiently in their own home. To learn more, visit https://fromaggio.com. NEW YORK (PRWEB) – Move over beer and wine, there’s something else to enjoy with cheese. Complex and nuanced spirits pair beautifully with many cheeses. Whisky Advocate magazine points out that “whisky really is an ideal accompaniment to many cheeses, in some cases superior, even, to wine or beer.” According to Charles Duque, Director, The French Dairy Board for the Americas, “Pairing cheese and spirits is a way to surprise and delight guests, allowing them to experience even familiar cheeses in a new way,” noting that the right Bourbon or Cognac make excellent cheese partners. Some cheeses are washed in brandy, so it should come as no surprise that they also pair well with it. The pungent flavor and luscious creaminess of Bleu d’Auvergne marries well with fresh pears as well as a smooth and fruity pear brandy. A good option is one from Clear Creek, which is based on the French style Eau de Vie de Poire William. Camembert is buttery with notes of mushroom on the back end that Duque notes complement Ardbeg 10, a single malt whisky that beautifully balances the sweetness of malt and the smokiness of peat. The creaminess of the cheese is a great foil to the whisky, especially when a small amount of water is added to the single malt to open it up. Pont L’Evêque is a washed rind that is soft and very rich, making it a full-bodied creamy cheese. Since Pont L’Evêque is originally from Normandy, a natural pairing is with Christian Drouin Pommeau de Normandie, a blend of Calvados and non-fermented apple cider. This is due to the regional connection between the two, and also because the sweet and tartness of the apples contrasts nicely with the savory quality of the cheese. Caramel pairs well with itself! Aged cheddar, with its rich caramel notes, complements the caramel notes of spiced dark rum such as Myer’s Dark Rum. The richness of the rum also has other flavors including tropical fruits, smoky oak, vanilla and spice. This allows it to pair well with strong flavored cheeses like cheddar, which develops many of the same flavors as it ages. The Cheeses of Europe Marketing Campaign, orchestrated by CNIEL (The French Dairy Inter-Branch Organization) and funded in part by the European Union, was designed to create awareness for the variety of European cheeses available in the US market and to suggest ways that American consumers can incorporate those cheeses into their diets, recipes and lifestyles. 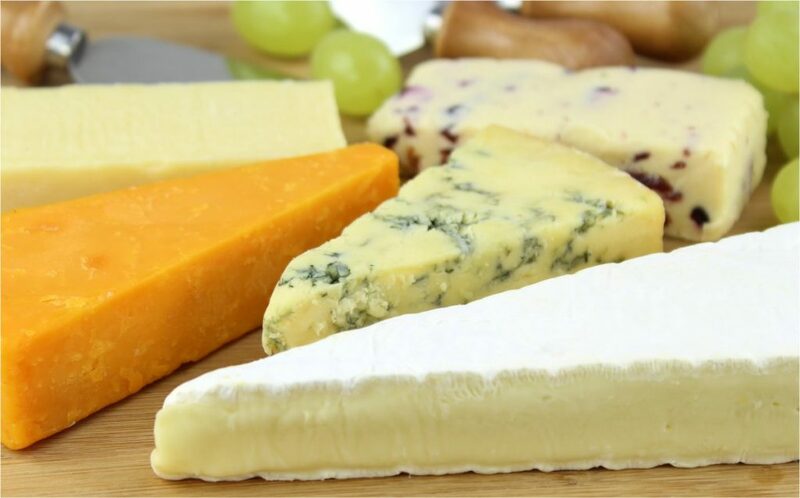 The campaign’s goal is to increase the appeal of European cheeses and strengthen their competitive position in the growing specialty cheese category.